Towards the end of 2015 I approached the team in charge at a local independent wrestling company called Fight Club: PRO to talk about the possibility of creating a website for them. In the time that they had been running they Fight Club: PRO had already developed a large following and I could only see a website as helping them go from strength to strength. To get the ball rolling I approached the team with an initial design already created. 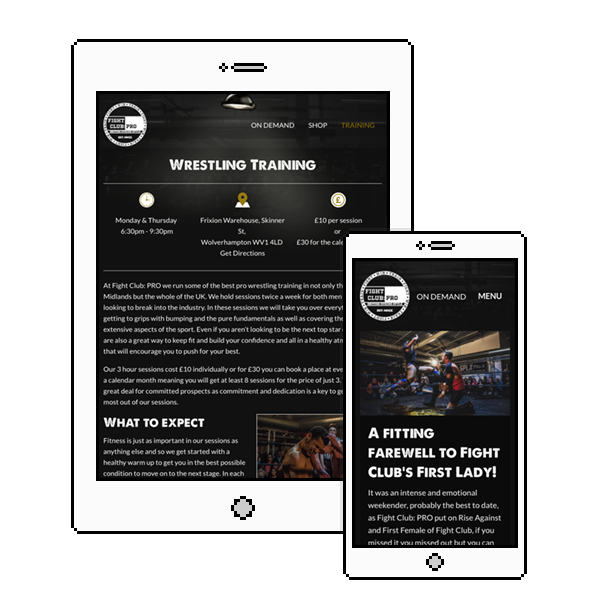 My initial design concept took a very standard approach to a wrestling website with links off to wrestler profiles, upcoming events, and latest news. However, after speaking again with the heads of the company they expressed that they wanted the website to reflect more of the company’s underground roots and act more as a chance for fans to quickly get to the main things that they wanted to promote which was links to watch past shows, links to buy tickets and information about training. From this meeting, I decided to start again with the design concept of the site and to develop a new design that focused on a strong homepage that signposted visitors out to the key information on the site. This grid style homepage aims to draw the eye to a highlight video of the latest event that the company held. From there a visitor can find links out to buy tickets to the next event as well as links to their store to merchandise. As the company’s tag line is “Train Fight Win” the other key area that the company wanted ready for going live was a page about the training school that the company run. To help this page take shape I went along to one of the companies training sessions to see how they were run and help put together the initial content for this page. I’m happy to say that as my first client based web project for a pro wrestling company this is a website I am very happy with and I look forward to seeing it go from strength to strength in the coming months.